The Fuji Electric's PHA strip chart recorder is an affordable inkjet recorder with an excellent rating for measuring range accuracy and analog trace accuracy. This 180 mm recorder offers brilliant six color recording utilizing Fuji's patented inkjet mechanism. Tiny piezo elements electronically dispense small dots of 0.3 mm diameter colored ink onto the chart paper. This advanced non-contact printing allows the PHA strip chart recorder to trace vibrant trend lines and to print sharp alphanumeric characters. The inkjet cartridges have a long life of up to 6 months of continuous operation. Each channel is assigned its own color, and reports generate in reference to that channel are printed in the corresponding color. As this method of printing requires only one mechanism, PHA strip chart recorders require fewer moving parts than conventional recorders – that means years of extremely reliable, trouble-free operation for the user. The PHA comes with a depth of less than 8", making the PHA strip chart recorder ideal for installation in shallow panels. One of the most powerful features of the PHA strip chart recorder is their ability to create a full complement of status reports – scheduled or on demand. You may specify daily and summation reports for any period of time from 1 to 24 hours. These reports are printed in crisp digital type and provide you with important information such as: Periodic Data for each Channel, Totalized Values for each Channel, Maximum & Minimum Recorded Value for each Channel and Time of Occurrence, Average Value for each Channel. The PHA strip chart recorder comes in 6 or 12 channel versions. As each channel has its own 16-bit A/D converter, the PHA recorders offer high speed sampling of the input signal. These inputs include most Thermocouple & RTD types plus a wide range of DC currents / voltages; each input can be scaled for your particular application from the recorder's front panel. With advanced math functions, the PHA strip chart recorder provides filtering, square root extraction, subtraction, and scaling of each channel. 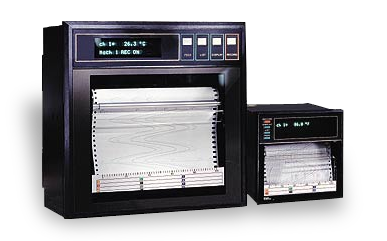 The PHA strip chart recorder is available in either continuous trace or dotted print versions. The PHA can be used for data logging, trend recording and transmitting data via an RS-485 communications link. © Copyright 2012 Procon Technologies Pvt. Ltd. All Right Reserved.